Thank you for your support in 2017! 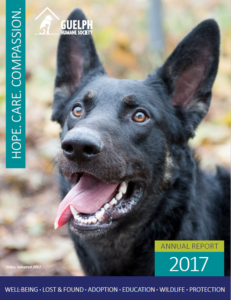 In the 2017 Annual Report, you will find a wide variety of stories about our work. From improved outcomes for wildlife, to saving neglected and critically ill pets, to promoting community-wide cat health. There is also an update about our new building. I know you will find a story that inspires you. Together, we are helping the most vulnerable animals in our community. Thank you! 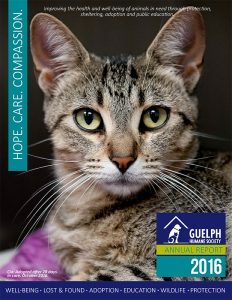 In 2016, the Guelph Humane Society played a local leadership role in the launch of Nature’s Canada national Cats & Birds campaign, served as a pilot location for Cat Healthy’s Healthy Adoption Checklist initiative and further developed our local Working Cat Adoption Program. The Guelph Humane Society expanded initiatives, knowledge and practices on how we can help more injured, sick and orphaned wildlife. In 2016, 3x’s more wildlife animals were successfully transferred to licensed rehabilitation centers than in the previous year. In 2016, we had a placement rate of 91%, where 1,408 companion and farm animals were adopted, claimed or transferred. 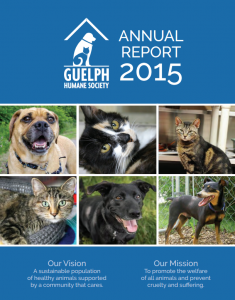 2015 was an exciting year full of new opportunities as Adrienne McBride (Executive Director) and Lisa Veit (Associate Director) joined the Guelph Humane Society team. One of our most significant achievements over the past year was implementing the Capacity for Care (C4C) program, a management tool that helps shelters better meet the needs of cats under their care by using strategies that reduce stress and illness. Our Barn Cat program has offered a unique approach to improving outcomes for our most difficult-to-adopt felines - such as those that are poorly socialized or have difficult behaviours such as poor litter box habits.